Since I moved back to Canada, I can’t deny any longer that I’ve packed on quite a few pounds (try 10lbs). I can SEE my face and body getting chubbier 😦 So, in all honesty, for vanity reasons more than anything, I started to pay more attention to my diet and be more mindful of what I eat – because as the saying goes… “a moment on your lips, forever on your hips”! To start, I needed something to gauge my food I take and catch all the unhealthy foods I’m mindlessly consuming. I’ve found Noom to be the best app so far. Yes, most of the time you’re estimating your portion with the easy units so you’re not getting measurements down to the 0.25 calories, but who wants to sit there for hours inputting precise numbers that are probably just guesstimates anyway? Another great thing is that different foods are colour-coded depending on their calorie density (e.g. fruits, veggies, complex grains being green, simple grains and white meat yellow, red meats and junk food red). This app keeps you motivated by setting mini goals each day and each day’s food intake is rated with a 5-star scoring system. Being a (closet) competitive gamer (I try to say I put those days behind, but the trait resurfaces once in a while), I always aim to get 4+ stars so I’ve found myself shying away from foods in the red category nowadays. That and I also can’t bear to live with the guilt of inputting many red foods. There are times when I want to skip recording those foods but in the end I’m just cheating myself, right? Anyhow, back to the main reason for this post… I was browsing through the recipes on Blogilates and found a super simple recipe for HEALTHY pancakes (say whatttt?) – all you need is a banana and two eggs (and some baking soda if you want added fluff). But then I started thinking I’d probably want something more substantial if I’m eating this for a meal (- I say meal because I’m never up early enough for brekkie so I aways end up making breakfast food for lunch.. Or dinner). Since the consistency of the batter is pretty wet, I figured I could add some oats to bulk it up (and add fiber).. Honestly I was scared it wouldn’t work, but it did!! 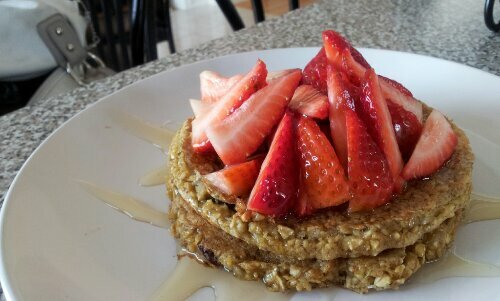 So here I present to you, my Flourless Banana Oatmeal Pancakes! – top the pancakes off with seasonal fruit to mix things up! Be creative! Oh and I know it’s hard to make choices to eat clean when you’re being tempted by the greater evil (perfect steaks! creamy pastas! desserts!). But with a will, you can definitely do it! I mean, if I can forego my favourite ginger molasses cookie, anyone can! This entry was posted in healthy living, recipes and tagged ambition, banana, beauty, breakfast, change, diet, easy, goals, health, healthy living, lunch, motivation, oatmeal, pancakes, recipes, routine. Bookmark the permalink. These look tasty! Any idea how many calories?